March 1st started with an early morning in Christchurch. Rae woke me up at 4am to find my tea already made and breakfast waiting. We headed to the airport, said our goodbyes and I was off to begin my Aussie adventure. I landed in Sydney at 8:30am and met Jennifer just past customs. Jenn and I have know each other too many years to count without feeling old. We immeadiately started gabbing about silly things we have done together and surprisingly survived. It was a great way to start the day! We headed off to Bondi Beach to spy on surfers, wander through the super soft sand and grab a banana smoothie. 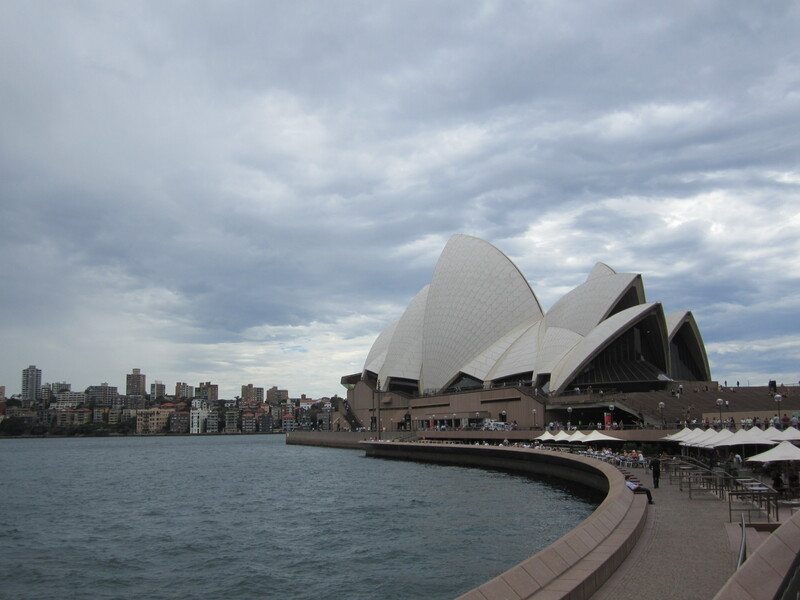 We were then off to downtown Sydney to check things out. Jenn found us a hotel in Darling Harbour, so we roamed around the walking paths there before hopping on the ferry to see Sydney from the water. A great tip for anyone visiting Sydney is to get a day pass on the local ferry and hop on and off as you please. We got a great view of the Harbour Bridge, Luna Park and of course, the iconic Sydney Opera House. We got off the boat at Circular Key, walked to the Opera House for a closer look, walked through the gardens of the Government House and then headed to the Rocks area for lunch. We happend to stumble on a corner cafe that had a sign in the window for a lunch special that we couldn’t say no to. 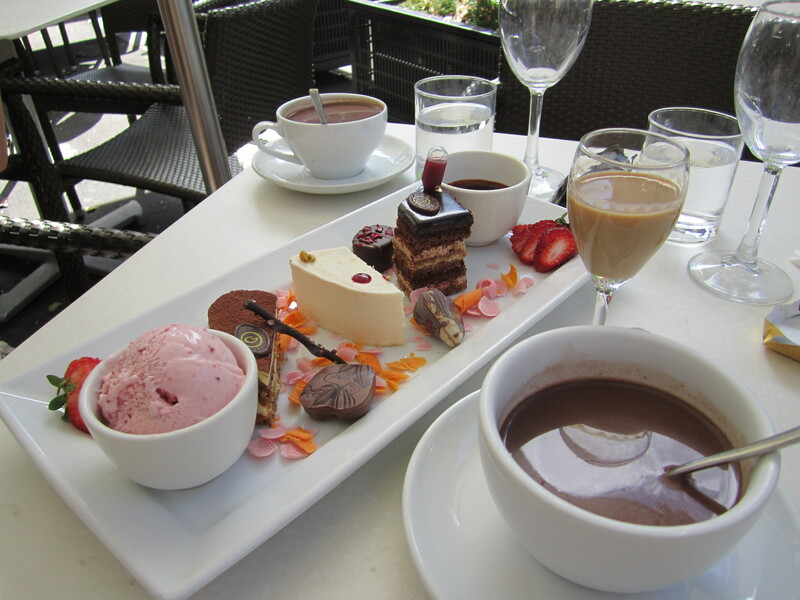 It turned out to be the Guylien Chocolate Cafe, so after we finished our lunch we decided to get a chocolate platter. It was delicious! We then slowly rolled ourselves back to the ferry and headed to Manly. Once we got back to Darling Harbour, we checked in at the hotel, had a quick shower and headed back out on the town. The next day we slept in (Jenn mentioned that that is rare when you have 2 kids under 3) then headed to the Fish Market. Jenn was surprised to hear that I had never peeled a prawn, so we picked up some fresh prawns and massive bits of tuna. We then hit the road to head home. 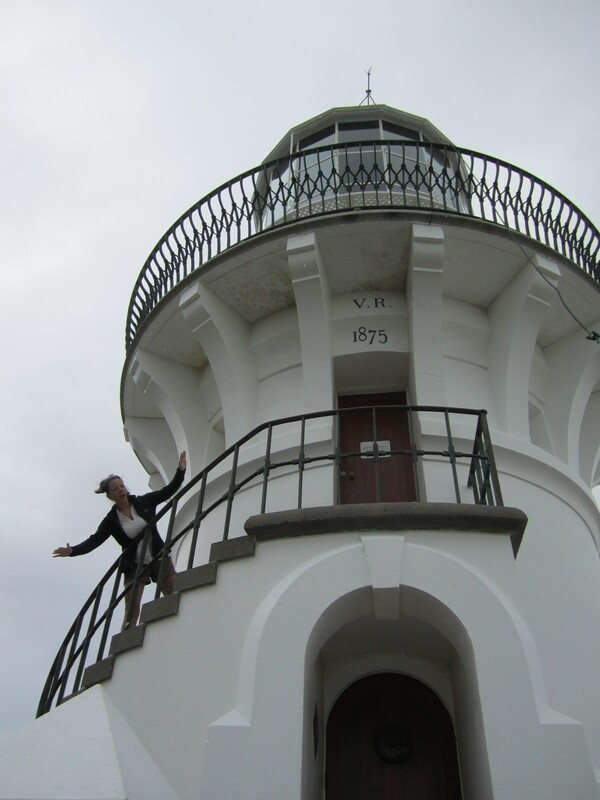 Along the way, we stopped at Seal Rocks and explored the Sugarloaf lighthouse. You can rent out the lightkeepers cottage and have a little vacation up on the cliff for the small fee of $4,700/week (just a wee bit out of the budget). We then headed up to Tuncurry to pick up the kids and have a little visit with Jenn’s in-laws. The kids were super excited to see their mom! Once we arrived at the farm, the kids were pretty tuckered out and were fast asleep before long. Jenn and I then got set up in “Kerri’s Place” (seriously, my second private cottage on this trip) to have my prawn peeling lesson and then to devour our amazing dinner. My sister will be glad to hear that her prediction of travel weight is becomming a reality, but I’m sure 5 or 6 months in Asia will help with that. The next 2 weeks flew by in a blur. Looking back, I can’t believe how fast it went. We kept ourselves busy with trips to the beaches, exploring the back river for a platypus, finding kangaroos at the beach, visiting the koala hospital, gorging at the macadamia farm, taking in the sights at the lookouts, sitting around the fire at night, jumping on the trampoline and playing, playing and more playing! We even went to the Kendall Club for the local meat raffle. That’s exactly what it sounds like…you buy a bunch of tickets and hope to win some meat. And win we did! Jenn even guessed which number would be our winner, and it ended up providing us with a big tray of lamb. Even the kids came away winners from the Club’s claw game. After all the kid adventures, it came time for some adult fun. We headed down to Newcastle with Phill and the kids to see Mack (the truck from Cars, the kids were soooo excited), then dropped Matthew and Hayley off at Phill’s parents. 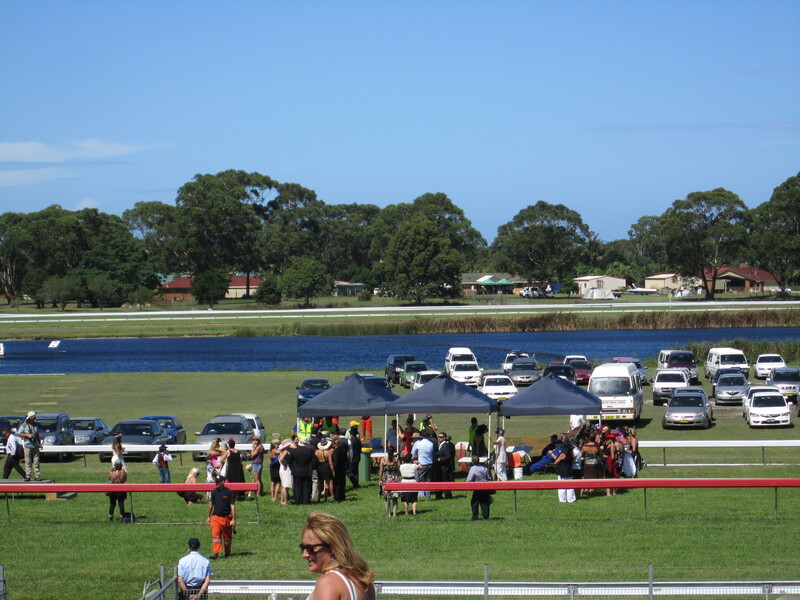 We were off to the Tuncurry Cup! I have only been to one horse race prior to this and was in complete awe of the crazy variety of dresses and hats (big hats, small hats, feathered hats, and hats that I wasn’t sure actually were hats). We got right down to business by betting on our first horse; Durham County. We continued to choose horses with names that reminded us of home, and found that strategy to be pretty…well…terrible. However, Phill ran into some friends and before we knew it we had these magical yellow bracelets that got us into the VIP tent with all the beer, canapes and cheese we could handle. Yehaw!!! After the races, we loaded onto the curtesy shuttle back to town and met Phill’s dad at the pub. Jenn and I then turned our luck around with a big win on the pokies (pub poker machines)…$6!! Sweet! Then came the end of my time in Kendall with the Smith family. Jenn and Phill made some of the coolest arrangements for me to get to Brisbane. My transportation was in a massive transport truck with their friend Shiney (Paul), and my accomodation was in a beautiful big house with Rebecca, Neil, Degan and Tiana. 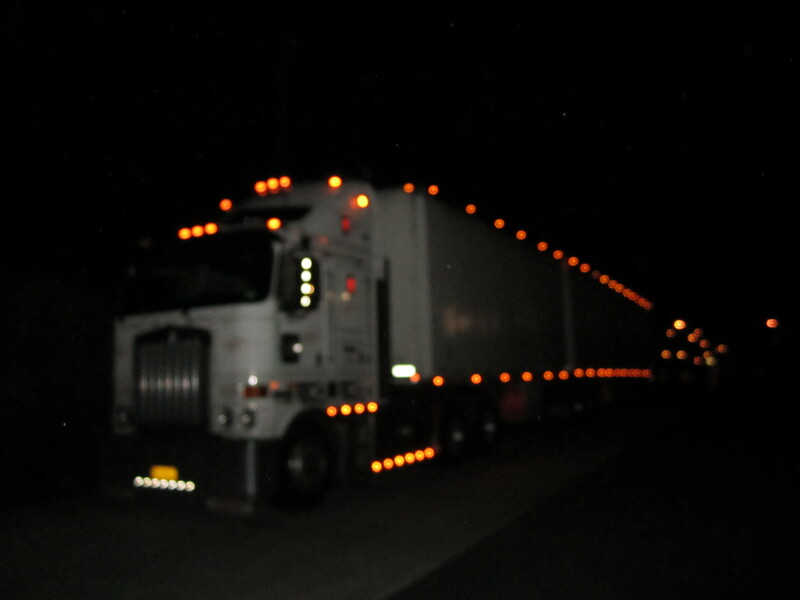 The truck amazed me! I have never been up that high in a vehicle, nevermind being up that high and driving through some beautiful countryside. We even got to stop at the top of a mountain to look out over Byron Bay and Surfers Paradise. The deal was that Shiney would drop me off at his stop and I would hop a cab to the house, but he wouldn’t seem to let that happen. He dropped me off right at the house. Rebecca met me at the door and showed me around. I can’t get over the incredible hospitality I have been shown on this trip. People who have no prior knowledge of me are opening up their homes and bending over backwards to help me out. I am totally blown away by just how open and welcoming people can be. Jennifer and Phill have opened my eyes to just how cool Australia really is. But the time has come to say Goodbye…for now. Next stop, Bangkok! This entry was posted in Australia, Traveling. Bookmark the permalink. I love the pictures!! You’ve already done and seen such amazing stuff. I miss you!! Fantastic!!!!!! love that you are meeting so many wonderful people!!!! Thanks for the updates. The pictures are great. Kaleb loves the pictures of Mack and wants you to take him to see Mack.